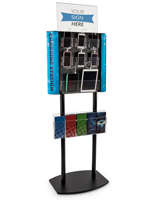 Thanks to the (limited) battery life of our favorite mobile devices, everyone is forever on the lookout for an available power source while away from home. Our multi-device charging stations provide just that. 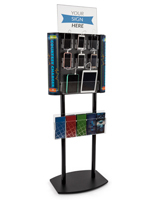 Designed for public use in a wide variety of settings, these user-friendly docking kiosks offer a quick and easy way to add extra juice to cell phones, mp3 players, and tablets while on-the-go. 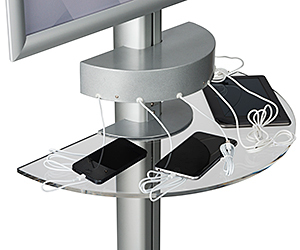 The floor stands and wall mount models feature six to eight universal charging cables offering micro-USB, Apple® Lightning, and/or legacy Apple® 30-pin connectors. 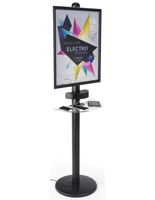 The multi-device charging stations also come with sign or poster holders to help increase their visibility, in addition to providing extra advertising inside shopping malls, airports, trade shows, and many other locations. 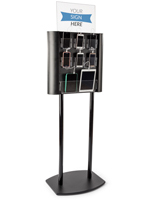 Starting with the wall mount versions, each rack organizer features eight separate cables with the aforementioned universal connectors (secured behind a locking panel). 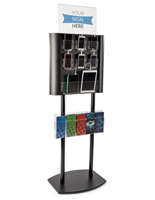 Your phone or tablet sits neatly inside one of the six small or one large clear acrylic pockets while being charged, providing constant visual verification while you wait. 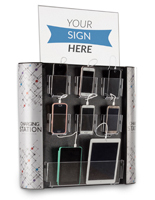 Acryic sign holders located at the top of each unit display custom printed inserts of your store's logo, promotional message, or other call to action. 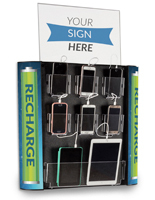 Manufactured from tough ABS plastic, these multi-device charging stations also feature models with stock-printed graphics on the sides to further attract attention. 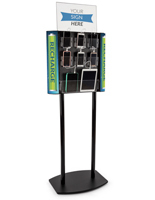 Floor charging stations come with more of the same features as our wall mount versions. 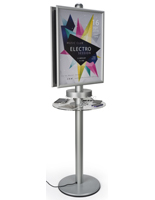 The iterations with poster frames offer excellent marketing possibilities for retailers. 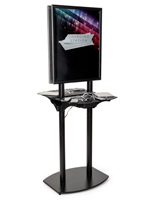 The big advantage to using floor stands is freedom of placement. 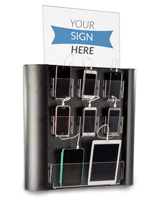 Unlike wall racks, these docking stations can be strategically placed in higher traffic areas, such as mallways, trade show booths, waiting areas, and so forth. Retail store entrances are another good spot for offering iPhone charging service to potential customers. 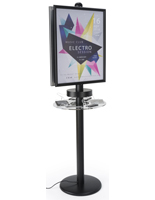 Knowing they can use this free service often leads to more people coming inside though word-of-mouth publicity. 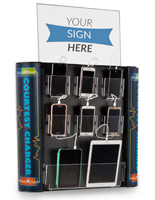 At the very least, you've enticed shoppers inside your place of business where they might make a purchase while they charge their devices. 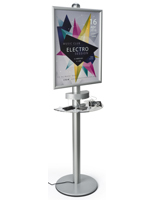 What it boils down to is common courtesy offered to the general public. 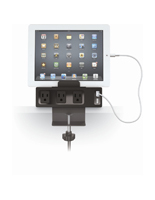 Too often, USB outlets seen in airport waiting areas are always being used. 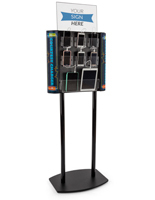 It's a rare thing to be able to spot one that's free, especially under crowded conditions. Our charging stations provide up to (8) individual openings available on an easily recognized display fixture. 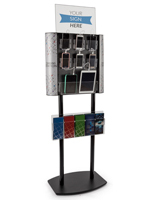 Whether on the wall or placed out on the sales floor or trade show booth, these cell phone docks are popular destinations that attract visitors, patrons, and customers.